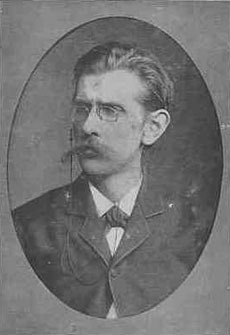 Danish imaginative writer, born at Thisted in Jutland, on the 7th of April 1847; he was the eldest of the five children of a prosperous merchant. He became a student at the University of Copenhagen in 1868. As a boy he showed a remarkable turn for science, particularly for botany. In 1870, although he was secretly writing verses already, Jacobsen definitely adopted botany as a profession. He was sent by a scientific body in Copenhagen to report on the flora of the islands of Anholt and Laesö. About this time the discoveries of Charles Darwin began to exercise a fascination over him, and finding them little understood in Denmark, he translated into Danish The Origin of Species and The Descent of Man. In the autumn of 1872, while collecting plants in a morass near Ordrup, he contracted pulmonary disease. His illness, which cut him off from scientific investigation, drove him to literature. He met the famous critic, Dr. Georg Brandes, who was struck by his powers of expression, and under his influence, in the spring of 1873, Jacobsen began his great historical romance of Marie Grubbe. His method of composition was painful and elaborate, and his work was not ready for publication until the close of 1876. In 1879 he was too ill to write at all; but in 1880 an improvement came, and he finished his second novel, Niels Lyhne. In 1882 he published a volume of six short stories, most of them written a few years earlier, called, from the first of them, Mogens. After this he wrote no more, but lingered on in his mother's house at Thisted until the 30th of April 1885. In 1886 his posthumous fragments were collected. It was early recognized that Jacobsen was the greatest artist in prose that Denmark has produced. He has been compared with Gustave Flaubert, with Thomas De Quincey, with Pater; but these parallelisms merely express a sense of the intense individuality of his style, and of his untiring pursuit of beauty in color, form and melody. Although he wrote so little, and crossed the living stage so hurriedly, his influence in the North has been far-reaching. It may be said that no one in Denmark or Norway has tried to write prose carefully since 1880 whose efforts have not been in some degree modified by the example of Jacobsen's laborious art.